After church on Sunday, we came and ate lunch and then the kids and I packed up and drove over to my mom's house. My dad is in Ghana training pastors so we thought we could for a quick visit. When we got there, my Aunt Linda was there. 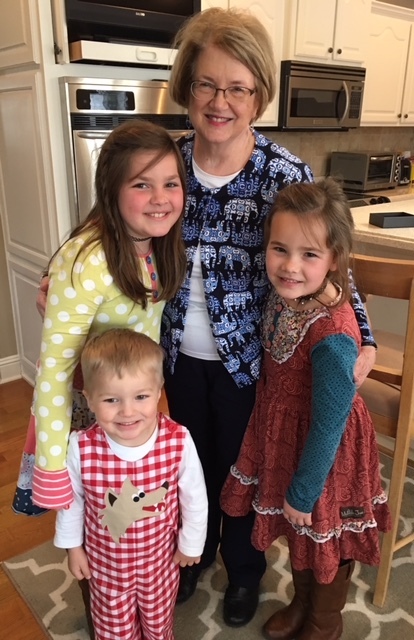 The kids were happy to see Nonny. Mom and Linda gave Hollis birthday gifts. Linda always buys really fun girly stuff for my girls. She gave Hollis the cutest sparkly purse and lots of jewelry. She also brought some of her old chokers and gave them to the girls since Harper has been obsessed lately with wearing chokers. She's like a teenager in the 80's. ha! My mom made cupcakes to turn it into a mini party! My mom gave Hollis a Madame Alexander doll. Linda gave the girls some a year or so ago and they are so pretty. I like them better than their American Girl Dolls. This one is so pretty because she has red hair. I love that Hollis still loves to play with dolls. We weren't there five minutes when Will Holden made a bee line for the tractor. (Don't worry - no key - it wasn't going anywhere). He's SO obsessed with this tractor. Every time he talks to my dad he asks about it. 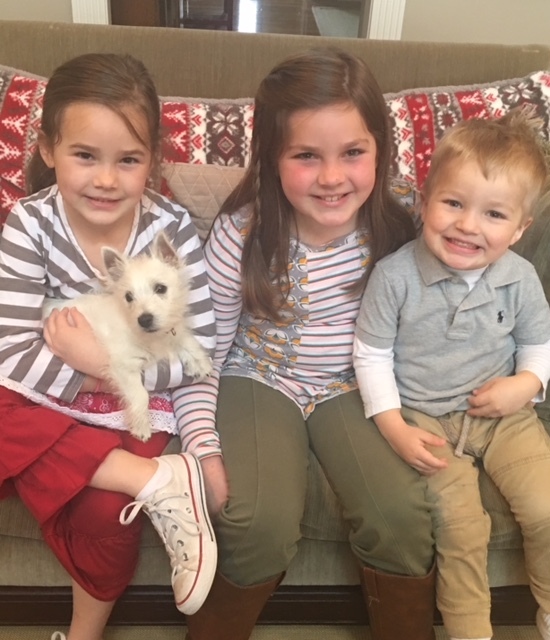 My parents just got a new Westie puppy. The kids have been anxious to meet him. He was very sweet. He's the fourth Westie my parents have had. The kids loved playing with them - especially Harper. Unfortunately I think she was very allergic to him. They want a puppy but I'm holding off at least another year. I'm just not ready for taking care of anything else. ha! We came home yesterday afternoon. It was a nice and quick trip. We have lots of plan for the rest of the week!